Ultrabooks now come in countless shapes and sizes, and we've seen display quality vary just as much. Though 1,366 x 768 may still be the norm, 1,600 x 900 panels aren't unheard of in this ultraportable category. But what about a screen that bucks the 16:9 aspect ratio for an extra-wide 21:9? Toshiba is mixing things up with its new premium Satellite U845W Ultrabook ($1,000 and up), the first laptop to feature that odd aspect ratio. Styled in the fashion of movie theater screens, the U845W's 14.4-inch, 1,792 x 768 panel adds more horizontal pixels -- ostensibly to enhance the movie-watching experience. In theory, too, that setup should allow for more room to multitask with windows side by side. So how good of an idea is a 21:9 screen in practice? Join us as we put it to the test. The U845W Ultrabook is the first laptop with a 21:9 display, but ultimately its odd, outsized dimensions are more of a nuisance than a boon. How would you rate the Satellite U840W? The most striking thing about the U845W is undoubtedly its squat design. At 14.5 x 7.9 inches, the laptop gives you plenty of horizontal screen real estate, but the 14.4-inch panel's 21:9 aspect ratio means the display is disproportionately short compared to what you'll find on other systems. (More on screen quality later.) Toshiba has talked up the U845W's unique form factor, saying its footprint is ideal for air travel since you won't have to worry about the person in front of you reclining their seat. When we traveled with the laptop, though, what we noticed most was how it tests the limits of a backpack -- it fits, but it's going to be tight. Dimensions aside, the U845W is a good-looking machine. Dimensions aside, the U845W is a good-looking machine. The lid sports a rubberized strip along the edge, but most of the surface is fashioned out of brushed aluminum in an attractive copper shade. 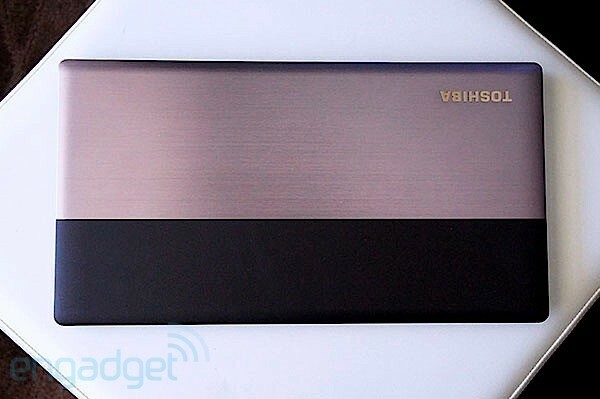 (In fact, it reminds us of the two-tone aesthetic Samsung used for several of its Series 3 models.) The bottom side is made of the same soft-touch material as the lid and the small dimples give it a firm, comfortable grip. At four pounds, it's just a hair heavier than the 14-inch Samsung Series 5 (3.94 pounds), which happens to be just as thick as the U845W (0.82 inches). All told, while the U845W's unconventional measurements make for a stocky silhouette, it still has the build quality and tasteful design you'd expect from a premium machine. 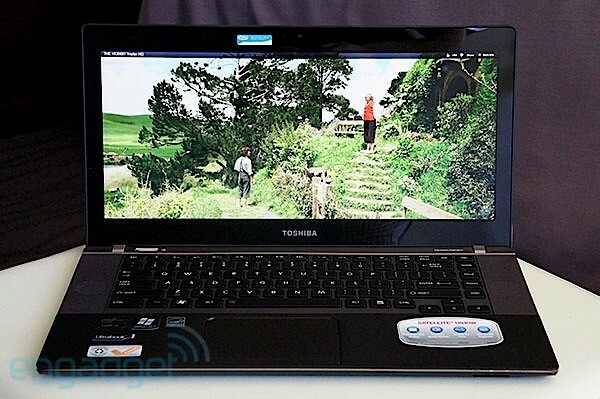 The U845W comes with a handsome selection of ports, including three USB 3.0 sockets (one of which has Sleep-and-Charge capability), an Ethernet jack, HDMI-out and separate ports for headphones and a mic (included here is Toshiba's Sleep-and-Music technology). Meanwhile, the memory card reader is tucked away on the bottom lip of the machine. The U845W's keyboard sports the island-style layout we see on so many laptops these days and indeed, like other Ultrabooks, it suffers from shallow keys and a little too much flex. When we gave the Ten Thumbs Typing Tutor a whirl, we managed 53 words per minute with a 6 percent error rate -- a poor showing for this particular editor. The problem is that the keys are sticky; simply pressing a letter requires a good deal of effort. Most often, your press won't be recognized, or the keyboard registers an adjacent letter. And, as with Toshiba's first Ultrabook, the Portege Z835, it doesn't help that the keys are unusually wide and vertically short. Because they're shaped the way they are, there's not much buffer between them. Toshiba didn't add a number pad on this spacious layout, instead using a good deal of space on each end for the speaker grilles. We do, at least, appreciate that the keyboard is backlit -- this feature isn't standard on Ultrabooks, after all. On to that Synaptics touchpad. We'd like to say the scrolling and clicking experience is smooth, but that's not exactly the case. First of all, we wish Toshiba had situated the touchpad dead-center rather than slightly off to the left; its placement requires some getting used to. Paging through websites and pinch-to-zoom works reliably, but other gestures such as image rotation only register every few tries. 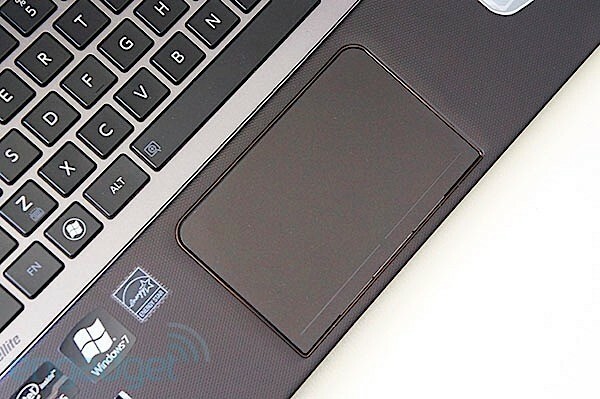 In general, we found that the trackpad offered too much resistance to accurately recognize our clicks and taps. On the bright side, palm rejection is great, and you won't have to suffer any accidental input. The 14.4-inch, 1,792 x 768 TN display is clearly the main attraction here, and it is great for watching 1080p videos. Viewing angles are sufficiently wide (you could accommodate three to four people huddled around this machine) -- that is, until you tip the screen forward or back, in which case images wash out quickly. Colors are accurate, if not overly rich, though the display's glossy finish kicks back no shortage of glare. Keep in mind that most media isn't filmed in the U845W's 21:9 aspect ratio; when we fired up Batman: Arkham City and various movie trailers we saw black columns on either side of the clip. Indeed, letterboxing appeared on nearly everything we watched. Keep in mind that most media isn't filmed in the U845W's 21:9 aspect ratio. Let's be clear: the 1,792 x 768 resolution ultimately amounts to your garden-variety 1,366 x 768 with some extra horizontal pixels. And while there are clear cinematic benefits to the U845W's form factor, the extra width makes everything on the screen feel smaller than usual. When viewing web pages and working through our Gmail inbox, we often felt the need to zoom in, as default text size seemed dwarfed by the laptop's ample screen real estate. Toshiba's SnapScreen utility is a pre-loaded feature that lets you take advantage of the expansive panel by viewing two windows side by side. Click the icon at the top of a window, and the computer will resize the window so you have room to view a browser and Windows Media Player, for example. This feature isn't as seamless as the Snap feature built into Windows; you have to specify which split view you want, and the options aren't as intuitive as we would like. It's nice to work in one window while viewing content or chatting in another, but since everything feels shrunken on this giant screen, the setup isn't perfect. Flanking the keyboard are two Harman Kardon stereo speakers -- a setup powerful enough to fill a medium-sized room and then some. When we streamed a couple songs from a '90s rap Spotify playlist, we were able to make out plenty of bass, though sound wasn't very crisp. SRS Premium Sound 3D software is on board, letting you tweak your laptop's audio profile depending on whether you're listening to music or watching a movie. Bumping up the bass level and SRS definition results in richer sound, though you won't be able to escape the tinniness completely. With a Core i5 Ivy Bridge CPU clocked at 1.7GHz, 6GB of RAM and a 500GB hard drive plus 32GB of solid-state storage, the Satellite U845W is a decent performer -- at least compared to other Ultrabooks with hybrid hard drives (most ultraportables at this price come standard with an SSD). On synthetic benchmark tests like PCMark Vantage and 3DMark06, the laptop notched higher numbers than many other 14-inch systems, including the Samsung Series 5 and last year's Dell XPS 14z. In ATTO, the U845W notched 103 MB/s read speeds and 97 MB/s writes. The U845W has Intel HD Graphics 4000, so you shouldn't expect too strong of a graphics punch, but its score of 5,471 is certainly respectable. It tops other systems with the same chipset, including the Lenovo IdeaPad U310 (4,549), ASUS Zenbook Prime UX21A (4,550), and the Samsung Series 9 (5,155). In Batman: Arkham City, the frame rate hovered around 50 fps, but we saw a much more modest 22 fps in Call of Duty. In everyday use, the U845W was responsive and ran smoothly, even with a dozen-plus tabs open across two browsers, Spotify running and the occasional gaming break. Cold-booting into Windows 7 Home Premium takes a brisk 20 seconds, and we never encountered any sluggishness or force-quits during our testing period. On our battery rundown test, which involves playing a locally stored video on loop with WiFi on and display brightness set to 65 percent, the Satellite U845W lasted five hours and 13 minutes. That's on par with other 14-inch Ultrabooks, such as the Series 5, which lasted five hours and nine minutes. Categorically, though, we don't see why these 14-inchers can't offer more impressive runtime compared to 13-inch ultraportables, especially since they have room for larger batteries. Toshiba doesn't skimp when it comes to its branded pre-load. The company's pre-installed utilities include BookPlace, Laptop Checkup, ReelTime and Sleep Utility, but the grand total comes to more than a dozen Toshiba programs. Third-party applications include Adobe Acrobat Reader, Adobe Flash Player, and trial software from Norton Internet Security and Skype. The unit we tested, the Satellite U845W-S410, is the $1,000 entry-level configuration. For that price, you get a Core i5 CPU, 6GB of RAM, and a 500GB 5,400RPM hard drive coupled with 32GB of solid-state storage. A $1,500 model steps up to a Core i7 processor and a 256GB SSD, and you can configure the system to run Windows 7 Professional instead of Premium, which comes standard. If you want a 14-inch Ultrabook, you won't find any other options with the U845W's unique dimensions and 1,792 x 768 display, but you will find many Intel-approved systems in the 13- and 14-inch range that offer faster performance -- not to mention higher-res panels. The HP Envy 14 Spectre ($1,400 and up), is a splurge, but its 1,600 x 900 IPS display is stunning (if not a 21:9 novelty like the U845W's). Additionally, it features Beats Audio and a memorable glass-and-metal design. You can find faster, longer-lasting Ultrabooks for a similar price. The MacBook Air is also a bit more expensive than the U845W, but it lasts longer on a charge and offers faster performance. At 2.96 pounds, it's also one of the lightest ultraportables around. On the 13-inch front, you might also want to consider the ASUS Zenbook Prime UX31A, which has a 1,920 x 1,080 IPS display and comes with either a 128GB or 256GB SSD. That system starts at $1,099, and it's also a very portable 2.86 pounds. Lastly, let's not forget one of our favorite Ultrabooks, the 13-inch Samsung Series 9 ($1,300 and up), which brings long battery life, fast performance, an impossibly thin metal chassis and a bright, matte 1,600 x 900 display. 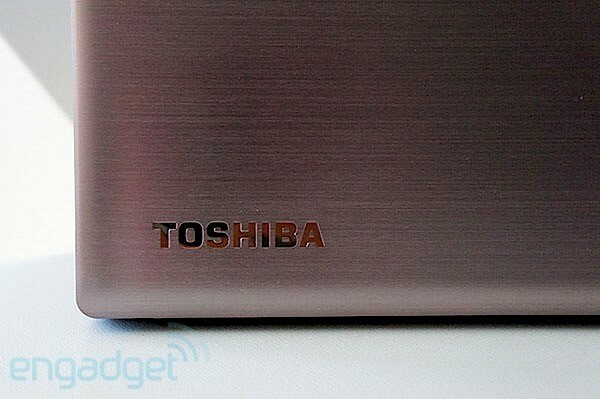 Toshiba also offers the Satellite U845 Ultrabook, a 14-inch Ultrabook with more conventional dimensions. You won't get the extra-widescreen display -- it's a standard 1,366 x 768 pixels here -- but you do get the same processor, graphics and storage. This laptop starts at $699, which is about as cheap as Ultrabooks get right now. There are so many Ultrabooks on the market that the available options may seem to blend together. So, if for nothing else, the Satellite U845W stands out for its unique display. Sadly, the actual display quality is merely mediocre, and while it's a treat to watch videos that don't exhibit letterboxing, that doesn't happen nearly enough. And truly, that's the big problem here: media isn't tailored to that super-wide aspect ratio. We like the U845W for its powerful speakers and attractive, portable design. It's just not the most practical system, and though $1,000 is palatable in a world of high-priced Ultrabooks, you can find faster, longer-lasting Ultrabooks for a similar price. If you're a cinephile with money to blow, you might enjoy the U845W as a novelty; after all, when content fits the screen, it's great. If you're just looking for a solid all-purpose thin-and-light, though, you'll find this laptop's unconventional shape more of a nuisance than a benefit.